What is a confidentiality agreement and why do employers use them? A confidentiality agreement is a contract between an employee and an employer, in which the employee agrees not to disclose or profit from any proprietary information related to company operations. Confidentiality agreements are legally binding contracts in which one party promises to keep trade secrets and not to disclose secrets without authorization from a superior. These agreements are usually binding until the private information is commonplace or the receiving party is released from the contract, whichever occurs first. While these contracts were once more common among executives and celebrities, they’ve now trickled down to ordinary workers – the kinds without golden parachutes, fat bank accounts or massive stock options. If you’re applying for a job in an industry where ideas are employers’ bread and butter, you’re likely to be asked to sign one. Before you commit, it’s essential to understand what these agreements are and how they can affect your current and future employment. While it’s obviously reasonable for your future employer to protect their intellectual property, you also have rights and requirements – namely, the need to make a living, should you change jobs, get laid off, or otherwise move on from the company. A confidentiality agreement is also known as a non-disclosure agreement or an "NDA." Confidentiality agreements protect private company information like financial details, business strategies, customer lists, or products and services underway or in development, and prevent employees from communicating or profiting from sensitive information. In addition to protecting sensitive information, these agreements protect patent rights and avoid issues. If a confidentiality agreement is broken, the injured party can seek monetary damages or compensation for breach of contract. Most confidentiality agreements also contain a provision that states that all technology or access to this sensitive information should be returned before the end of the agreement or employment, whichever comes first. Confidentiality agreements must determine two times periods: The period of time in which the disclosed information is determined and agreed upon and the period in which the information must be kept secret. If a time period is not specified, there is a greater chance of litigation and judicial review to determine fair and equitable ruling. In most cases, confidentiality agreements are signed when an individual is first hired and are valid through the termination of their employment or, in some cases, a period of time after employment ends. However, in some cases, you may be required to sign a confidentiality agreement prior to an interview. Companies do this for a few reasons. First, they might not want you to share their interview questions or their recruiting practices. Or, they might be planning to discuss company issues or problems that they want your opinion on, but don't want to become public. In other cases, the interview might include the disclosure of trade secrets. It's important to make sure that you aren't agreeing to anything that would hinder your ability to find another position should your job not work out with one company. 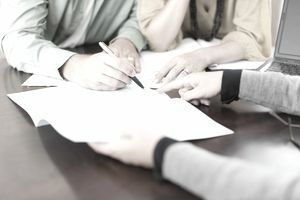 In all cases, be sure to read the confidentiality agreement thoroughly before signing and don't be afraid to ask for specifics about what the agreement would mean for you. As uncomfortable as it may be to question the interviewer, it’s important to get the facts about the contract before you sign it. Don’t assume that the company will give you a pass if they lay you off, for example. A confidential agreement is legally binding, so consider getting legal advice before signing a document that can impact your future employment. An employment attorney can tell you how the agreement might affect your ability to get a job at a competing firm, as well as how it might constrain any contract work or freelancing you might plan to do on the side.